There’s nothing better than getting outdoors, breathing in fresh air, and having your pup trot alongside you with a slobbery grin. They’re so happy to be exploring with you, you can’t even get mad about that slobbery calf swipe as they run past you with their tail wagging! Because let’s face it, man’s best friend loves to feel like one of the team. As soon as they’ve got that pack strapped on – they know they’re in for an adventure! Adventuring can take it out on your dog, and his gear. 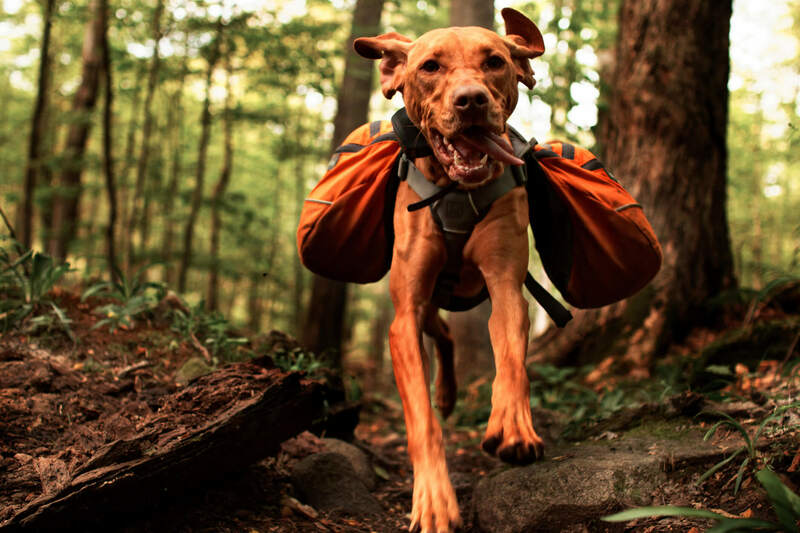 Chasing new smells into bushes and getting caught on various limbs on the trail are likely to snag your pup’s gear. 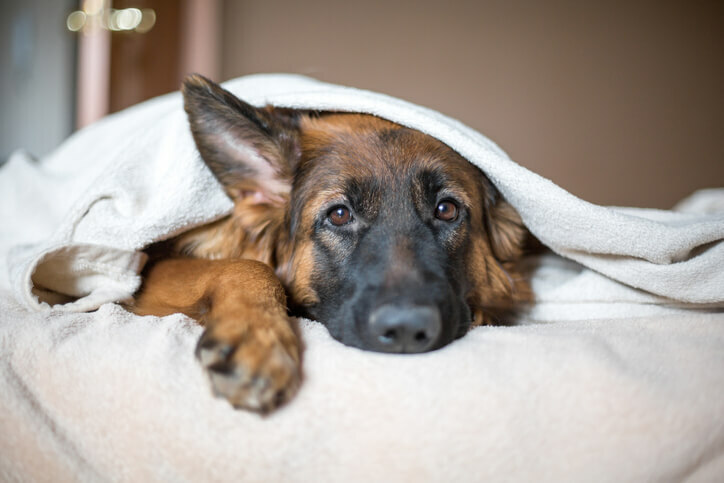 Whether you’re in the market for a replacement dog pack or looking for your first one, you can find a rundown of our favorite dog packs in this article. Don’t forget your leash, plenty of water, poo bags, and dog food! Being Amazon’s Choice, we thought we’d start with this one. This lightweight pack is perfect for day hikes, quick getaways, and everyday errands with your pup. Designed in a saddlebag style with expandable compartments, reflective accents and bright colors to enhance visibility. It has adjustable straps and a mesh harness to keep your dog cool on hot days and a D ring where you can leash your pup on busy roads! $34.99, available in Small, Medium, and Large. 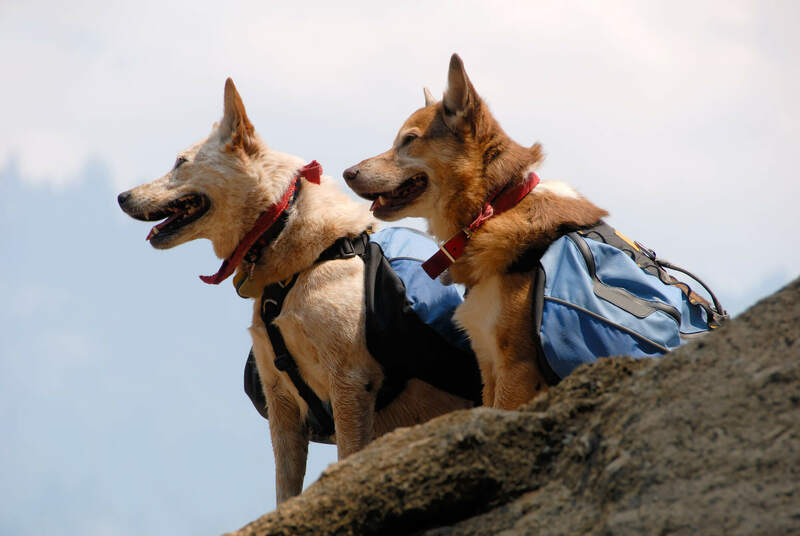 Two dogs with backpacks paused while hiking on a mountain trail. OneTigris is a tactical outdoor gear store, so rest assured this dog pack is made with great quality. Weighing about one pound and made out of brown cotton canvas, this pack is made for the fashion forward pups. Functional saddle bag style, the only con we found was that the D rings on the side of the saddlebags seem to catch on things. $32.98, check the website for availability. If you enjoy multiple day adventures, this pack is the one for you. This pack is designed to carry essentials for long trips with detachable saddlebags, 2 one-litre collapsible BPA free hydration holders, and built-in reflective features so you guys can stay out later. External gear loops, two leash attachments and five-point adjustment system offer a customized fit and full range of motion and functionality for your pup. A little more expensive than the others at $149.95 on Amazon, available in small, medium, large, and XL. 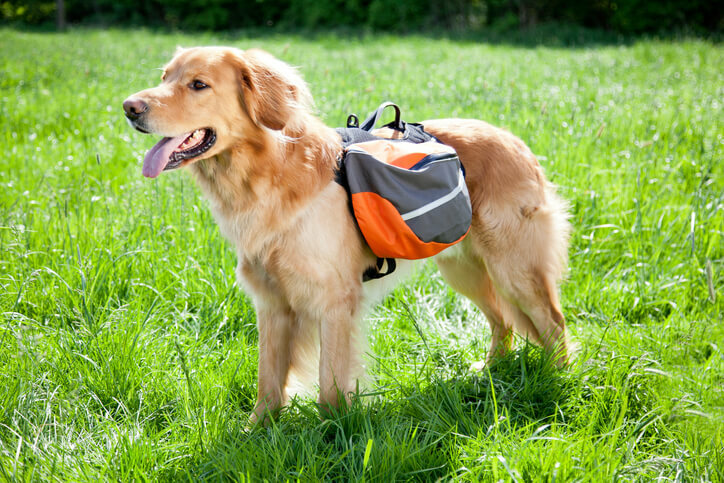 This dog pack is great because it comes with a free collapsible set of dog bowls for your pup. 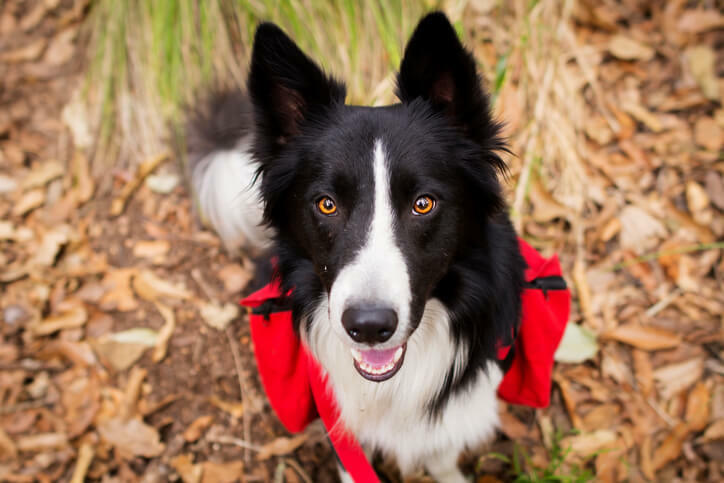 Although known to run on the small side, this lightweight breathable dog pack is ideal for small to medium dogs and everyday hiking. It also comes with a handle at the top and a D ring for his leash. $29.99 on Amazon, available in small, medium, and large. With plenty of room for the essentials, this saddlebag style dog pack is another great option for the long hauls. Or just wanting to go for a day hike? Simply take off the removable saddlebags and you’re good to go with a lightweight harness! Double padded mesh bottom paired with lightweight rip resistant nylon material, your trail buddy is ready for any adventure! $29.99 on Amazon, available in one size with adjustable straps. 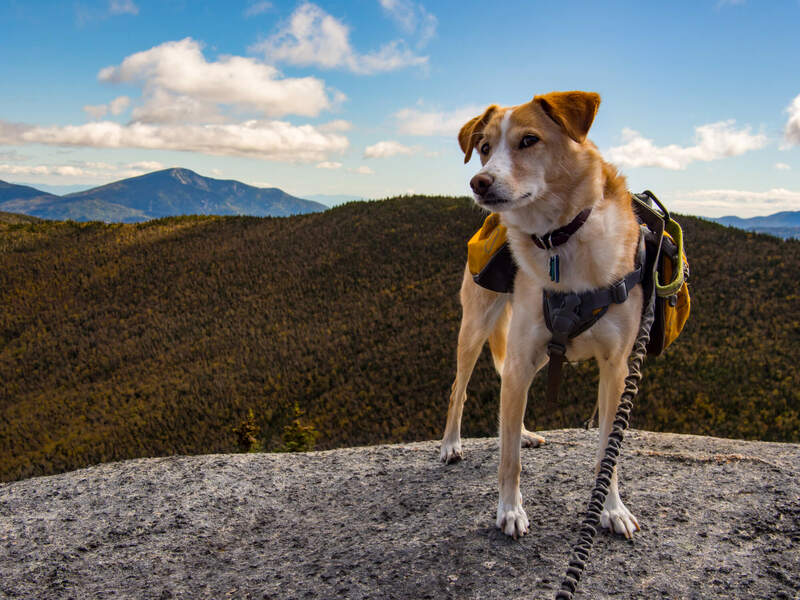 An adventurous dog with a backpack on a mountain summit in the High Peaks region of New York. 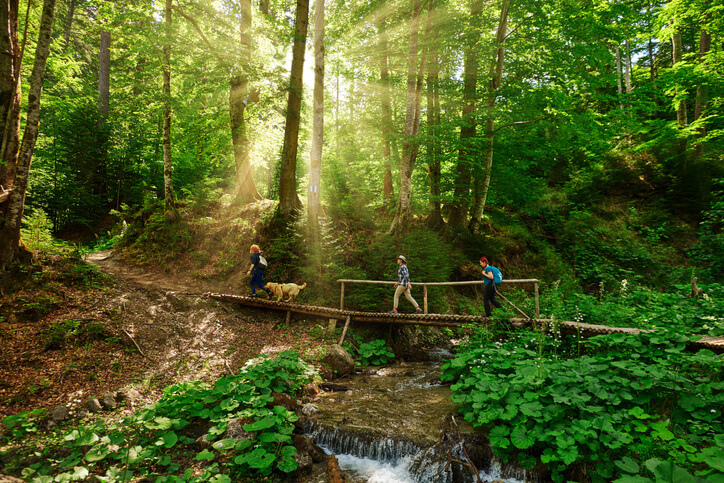 Now that you’ve found the perfect hiking gear for your pup, it’s time to hit the trails! Happy hiking! Driving to one of your favorite spots? 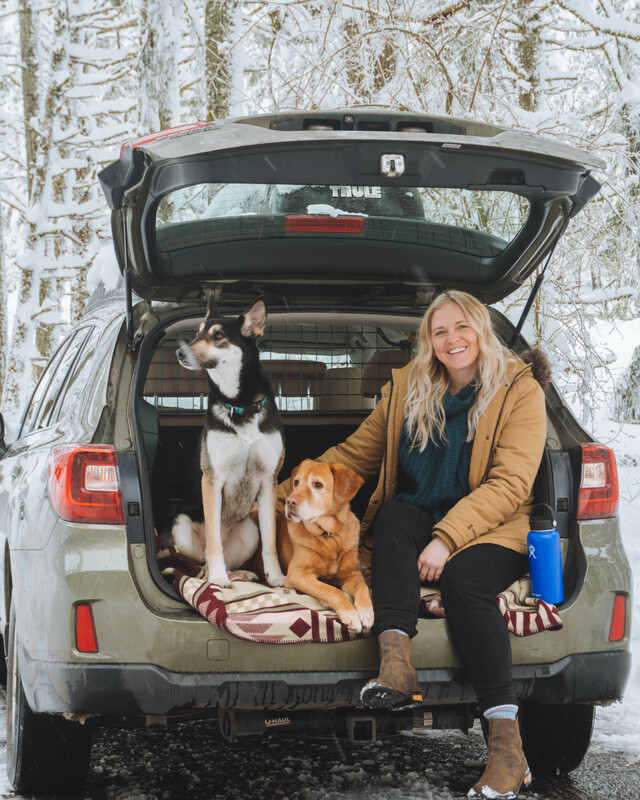 Make sure your pup is secure with the Travall Guard! Like these packs? Share our list with your friends!